we have been through storms before—it’s the wind that killed us,” she says. Hurricane Matthew pounded villages along the Tiburon peninsula in coastal southwest Haiti last week. Torrential downpours and 145 mph winds felled trees, swept away people and animals, and destroyed up to 90% of homes in some areas. All told, 2.1 million people were affected and 1.4 million need immediate help. Food stocks and crops were destroyed, a critical loss for the entire country because the area is a key producer of Haiti’s food supply. Clean water is in short supply and poor sanitation threatens to trigger another outbreak of cholera, a disease that has killed some 10,000 since the 2010 earthquake. Already, new cases are spiking. Afraid her house would collapse, Bernadette rode out half the storm standing in a field about 350 feet away. She was unharmed, as were her loved ones. In that singular way she is fortunate. 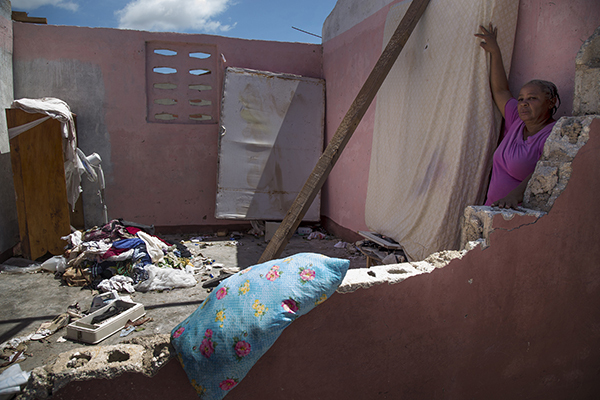 But the storm turned her little neighborhood of two-room, concrete-block houses in the popular beach town of Port Salut into a pile of rubble. At least 13 people had died during the storm. When CRS visited the community this weekend, people picked through the rubble and made piles of mangled roofs and fallen trees. Still in shock, residents said they could not believe how the hurricane, which many of them said they didn’t even know was coming, could take everything they had so quickly. Most had no food in what was left of their houses. Much of the fruit from fallen trees was gone. They said they did not know where their next meal would come from. CRS is bringing food, blankets and other emergency supplies to those communities as we gear up to help people like Bernadette repair their houses and rebuild their lives. 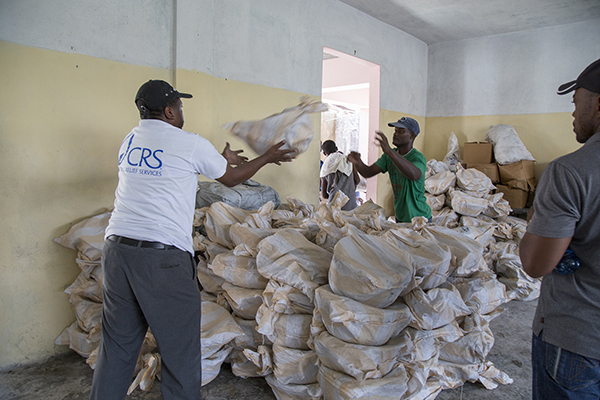 We are setting up operations in Jeremie and Dame-Marie, hard-hit areas left unreachable for days after the storm. CRS emergency experts, arriving from around the world are designing projects to help people get clean water and avoid contracting cholera. Agriculture teams are working with farmers whose crops were completely destroyed so they can replant in time for harvest in December, when a food shortage could set in. Days after the storm passed, giving way again to blue skies and pink sunsets, school books and clothes dried in the Caribbean sun. Mattresses were propped against walls to air out. Residents climbed their walls to fasten the metal roofs the storm had violently ripped away from so many homes like Bernadette’s. And the air filled with the clanking of hammers, signs that, amid desperation, work to rebuild homes had already begun.